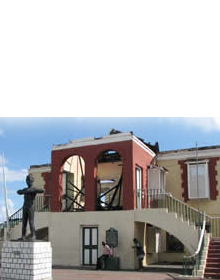 The Wesley Methodist Church, erected in 1825, can be described as a Jamaican Georgian building with some elements of Palladio. The Wesley Methodist Church is an excellent example of one of the oldest structures in the community. It was constructed during the period of the Consolidated Slave Laws, which were enacted to hinder the growth and spread of non-conformist theology in Jamaica. Its erection is proof of the Methodists' successful attempts to overcome the hurdles of the Consolidated Slave Laws. The history of the Church is important in understanding the spread of Methodism in Jamaica during the pre and post emancipation periods. In addition, it played a significant role in the integration of coloureds, blacks, and whites. 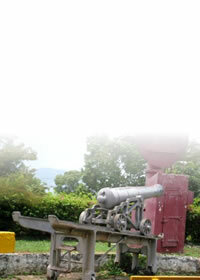 It is also one of the few remaining examples in Jamaica of churches that slaves used for worship. "Minister I would rather die upon yonder gallows than live in slavery." The Wesley Methodist Church is associated with significant patterns of Jamaica's social and religious history. This includes the involvement in the movement to end slavery, as many of its leaders voiced their opposition to the system. In addition, it also played a major role in the movement towards the disestablishment of the Anglican Church and the widening of the role of non-conformist Churches in Jamaica. 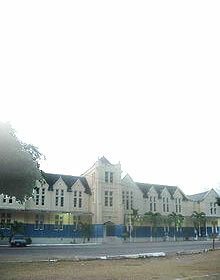 Wesley Methodist Church is located in an inner city area. Though it has been vandalised on a number of occasions the Methodists have tried to maintain the building. The large wooden windows and doors have been replaced by grills.